A few weeks ago I had a little rant about Blueberry 'flavoured' Paw Ridge children's porridge. My rant was driven by their claims of '100% natural ingredients' which didn't mention where the blueberry flavour had come from, and a whopping 12% sugar, most of which wasn't naturally occurring and had, for some reason, been added as a major ingredient to what was otherwise a healthy food stuff. As a result of my rant, I was contacted by Rude Health to see if Lara and I wanted to put their organic fruity porridge through our rigourous Mother & Baby tests! I had previously tried some of the Rude Health's museli products, some of which I loved, some of which I managed to offload on my work colleagues because I didn't like the chunky bits! We tried the Rude Health Fruity Date Porridge, and loved it! After my previous porridge experience, the first thing I did was check the ingredients. The box contains the following... oats, more oats, oatmeal, dates (12%), apricots, apple, ground apple and cinnamon. Now, that really is 100% natural ingredients and there is nothing disguised with fancy names. I then checked the nutritional content. Interestingly, it is actually higher in sugar than the Blueberry Paw Ridge but that's to be expected... with this amount of fruit inside the porridge, this is how much naturally-occuring sugar I would expect. There is no added, refined sugar, just that which is contained in the dried fruit. For this reason, I would never expect to give Lara a huuuuuge bowl of this porridge for breakfast but I wouldn't have any problem giving it to her in small amounts. I know that with a bowl of fruity date porridge then she probably won't need one of the other pieces of fruit that I would normally offer her later in the day. At 16% sugar it is still significantly lower than most "children's cereals" which often come in at between 25 and 37% sugar. The Rude Health porridge passed Lara's test. She eats it with as much enthusiasm as her other breakfast cereals (which is not that enthusiastically at present as she seems to have gone of the idea of breakfast at present, but things change and she'll be back to breakfasts soon). I wasn't sure I was going to be as much of a fan as I tend to go 'bluergh' to anything that tastes strongly of cinnamon. Surprisingly, I actually feel that the level of cinnamon is JUST RIGHT. There is just enough for it to taste wintery and warming and I think I'd miss it if it weren't there. The porridge is no more difficult to cook than the finely milled Paw Ridge we tried the other day - it cooks in 3 minutes in the microwave but Mr. B. insists it tastes better when cooked on the stove. 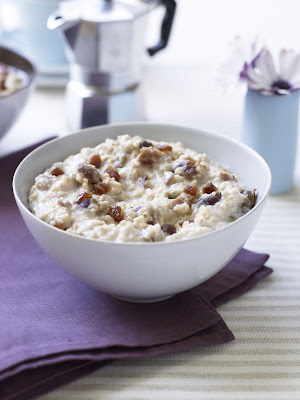 I love the pieces of date and apricot in the porridge, it makes it so much more interesting than a normal plain bowl full of porridge oats. Rude Health, thank you for proving that porridge can be tasty and healthy.